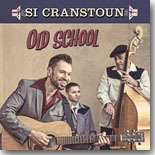 Cranstoun抯 latest release, the apppropriately-titled Old School (Ruf Records), will be musical nirvana for any music fan who digs the music of the early pioneers of rock and soul --- Elvis, Jackie Wilson, Sam Cooke, etc, With a whopping 16 tunes, all but two originals, the album should be a wonderful treat for fans of those artists and genres. For those fans, it will be impossible to listen without getting a hop in your step. The two covers are keepers, too. Billy Swan抯 揕over Please� gets a cool calypso reworking, and the Louis Jordan tune 揃ig Bess� is guaranteed to get listeners on their feet and moving before it抯 done. As great as Cranstoun does on these tunes, it would be a shame to not mention the excellent band backing him --- Mex Clough � drums, Stewart Panaman � bass, Dan Faulkner and Drew Davies � saxes, Jon Radford � trumpet, Patrick Hayes � trombone, Neil Casey and Paddy Milner � piano, and Simon Picton and Jay Gipson � guitar. These guys obviously love this music; it shows with every note played and sung. For those whose day needs a pick-me-up, I strongly recommend Old School. Listening to this CD will turn a bad day into a good one and a good day into a better one.